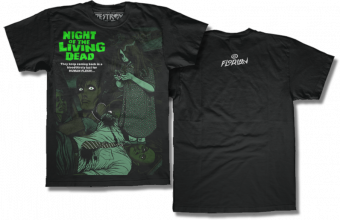 The Art of Florian Bertmer: Night Of The Living Dead Shirts! Night Of The Living Dead Shirts! here`s my latest shirt for shirts & destroy.this time we did a run of shirts on everybodys favorite zombie movie,the cult classic night of the living dead.the shirts came out great and i hope you dig them.the design was originally done as a movie poster for Texas Frightmare last year where Romero himself was attending. Great shirt fella. I bought one!!! New Print available from Moon Editions!